Your guide to the best of New Music Friday featuring bülow and Aldous Harding. At a time when everything on the radio sounds identical and even alt-pop has become formulaic, Aldous Harding is gust of crisp, fresh air. The New Zealand singer/songwriter made huge waves with “Imagining My Man” in 2017 and backed it up with one of the best albums of that year. (Buy Party here). The renowned hat-enthusiast picks up where she left off in 2019. “The Barrel” was an absolute triumph and the just-released “Fixture Picture” is another indication that Designer (due April 26) is going to feature prominently in year-end lists. Hannah (her real name) also unveiled the video for “Fixture Picture” today, and it’s a surreal affair that captures the breakout star’s oddball aesthetic and easy charisma. 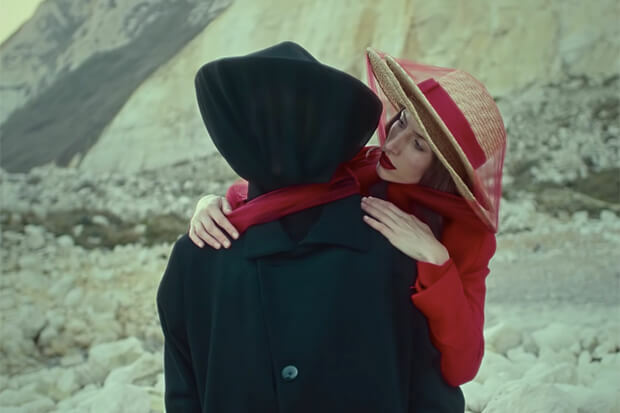 The clip, which she co-directed with Jack Whiteley, begins with Aldous strumming her guitar against the white cliffs of Dover. Our heroine looks resplendent in a blood red ensemble and ultimately performs the song with her soberly-attired band. The scenery and outfits are striking, but it’s the singer’s kooky facial expressions and dramatic poses that elevates this to art. Watch “Fixture Picture” below and revisit “The Barrel” at the bottom of the post.